Introducing our new Dual Density Impact Reduction Floor Mat—a multiple purpose impact reduction floor mat developed to aid in the reduction of impact injuries sustained while providing excellent comfort, safety and increased productivity in the workplace. 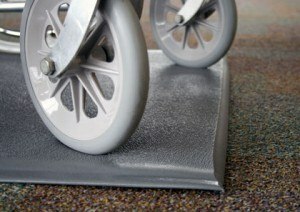 A durable, integrated slip-resistant top wear layer of high density vinyl foam polymerically bound to a soft, moisture resistant proprietary closed cell foam, with sweep edges allowing for easy wheelchair access. 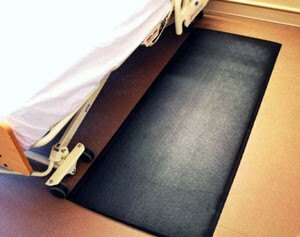 Our Dual Density impact floor mat was designed as one of the lowest profile mats available reducing the risk of being a trip hazard when being used in patient care and other various applications, offering easy on and off wheelchair and cart access. The Dual Density mat is resistant to degradation by inorganic acids, organic acids, reducing agents, detergent solutions, alcohols, aliphatic hydrocarbons, mineral oils, amines and aldehydes. Independent lab testing conducted for Impact Attenuation per ASTM F-1292-04 indicated excellent impact absorption at 18” and below reducing the risk of injury when using our Dual Density floor mat on Vinyl Composition tile flooring and for patient care applications. Independent lab testing conducted met UL 94 HBF fire retardancy. Dual Density Floor Mats can be embossed with company logos or taglines to promote your brand or product. Graphics are permanently embossed into mat surface. 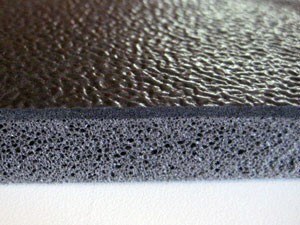 The impression finish can have a glossy, textured or frosted appearance. 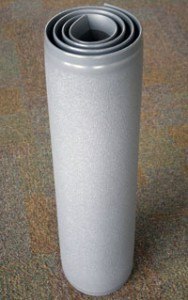 Standard stock mats are plain and do not contain any imprint. Our standard mat is 29” x 70” x 5/8” and is not only durable, it has an integrated slip-resistant wear layer top made of high density vinyl foam that is polymerically bound to a soft moisture resistant proprietary closed cell foam. Mats are rolled and individually boxed for easy shipping and handling. Contact your local American Excelsior representative for more information.